Just in time for St-Patrick’s day, here is a simple and traditional Irish soup, one which calls for nothing less than lamb kidneys. Lamb and mutton are very popular in Ireland and the landscape there is ideal for grazing sheep on luscious green pastures. Mutton is somewhat less popular outside of Ireland, but has a great, stronger tasting, meat. Organs have all the praise in Paleo community, but some organs like liver get all the attention while others fail to be recognized to their full potential. Kidneys are one of them. They certainly are an acquired taste, but they can become truly delicious when properly prepared and after having them a few times. Since kidneys are far from being popular, you should be able to get them for a very low price. I even get them for free from a local sheep farmer who’s happy to give them to me since I already buy a lot from him. Saving money is just one of the benefits of regularly eating organs. Another benefit is that most organs are very nutritious and packed full of essential minerals and vitamins. Kidneys are no exception. Lamb kidneys are a great source of selenium, iron, vitamin B12 and riboflavin. They contain good levels of zinc, copper and phosphorus. 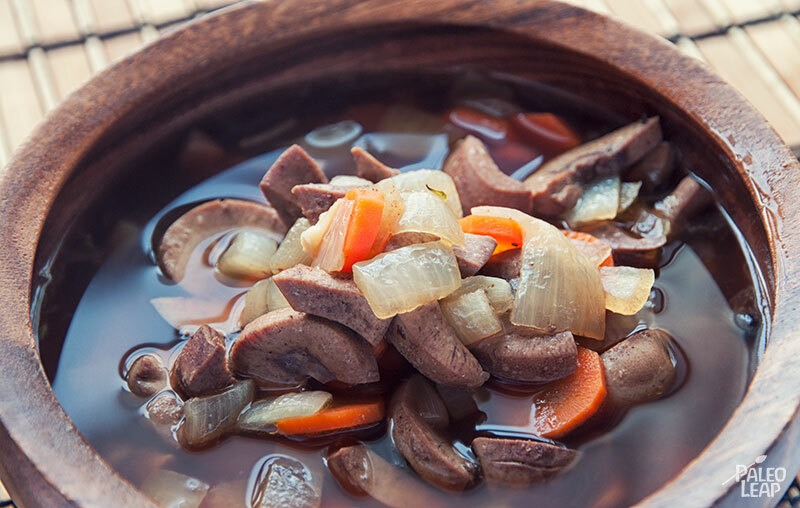 Unlike muscle meat, kidneys also contain an appreciable amount of vitamin C.
This recipe is not for those who dislike eating organs or for the faint of heart because the taste of the kidneys is not hidden and is really the main attraction of the dish. This soup is for you, however, if you appreciate eating almost anything in an animal or if you’re adventurous and ready to discover new flavors. Whole kidneys have a hard fatty white core that needs to be cut off before cooking with them. Slicing the kidneys in half lengthwise is the best way to expose that white core and to cut around it to remove it. Otherwise, the recipe is really simple to prepare and a crock-pot can be used instead of a pot on the stove top. Prepare the kidneys by removing any membrane covering them, if present. Cut them in half lengthwise and cut around the fatty white core to remove it. Cut each kidney half into thick slices. Heat a stockpot over a medium heat, add the cooking fat and cook the onions, stirring occasionally, until they start to soften, about 6 minutes. Add the kidney slices to the hot pot and brown them on each side. Pour in the stock and add the whole peppercorns, thyme sprigs and bay leaf. Bring to a boil, then reduce to a simmer and let simmer, covered, for about 3 hours. Add the carrot slices in the last 45 minutes of cooking. When the soup is ready, discard the thyme sprigs and the bay leaf, and use a slotted spoon to remove most of the whole peppercorns. Add 1 or 2 tablespoons lemon juice to taste, taste for seasoning and enjoy.